The Ghost Bride is a story of a young girl named Li Lan who finds herself haunted by the ghost of a spoiled merchant's son in her hometown of Malacca, Malaysia. Even worse, her father, a heavily in debt opium addict, is considering a marriage proposal from the ghost's parents who wish for her to become their son's "ghost bride". Li Lan of course finds the idea repugnant, but as the dreams become more intense, and the pressure on her father grows, Li Lan despairs of ever escaping her ghostly suitor. In desperation, Li Lan decides to take matters into her own hands and what unfolds next is a series of events that takes her down a path of family scandals, affairs, murder and into the afterlife itself. 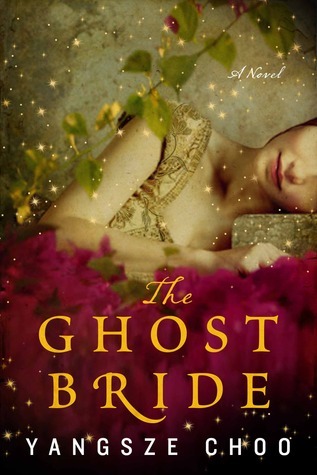 I was pretty surprised to see the twists and turns of this story as it morphs from something I thought would be more reminiscent of an Amy Tan novel into a full-on ghost story with Li Lan stumbling onto a plot of corruption among the Judges of Hell. If you grew up in a more traditional Chinese household, then the creatures, rituals and characters in this book will feel pretty familiar. The book also borrows heavily from ideas of reincarnation and of cause and effect. Actions from generations past are relived repeatedly in the spirit world. Old hurts, untamed ambitions and simmering resentments tangle together in an underworld that is as eerily convoluted and bureaucratic as the real world. Li Lan starts out as a dreamy young girl, but learns quickly to rely upon her wits and determination as she struggles to reclaim her life from ghosts and to escape the spirit world. I found this book to be very entertaining and imaginative, although when I tried to explain the plot to Mr. Artist later, he proclaimed it to be "ridiculous." Part romance, historical drama and fantasy, I think there's enough of all three to keep anyone guessing. The ending in particular took me for a bit of a surprise... but that's all I'm going to say about that! One thing's for sure, I will definitely keep an eye out for the next Yangsze Choo novel!